Those painful slivers of skin around your nails can cause your skin to tear if you try to pull them, so don't! To prevent hangnails, the key is to keep the area moisturized. When the cuticle is dry and brittle, these strips of skin become frayed. Smearing on a cuticle cream with hydrators like almond oil once or twice a day will remedy the problem. If you do happen to get a hangnail, make sure you soak your hands in water before you carefully snip with sterilized nipper or nail scissors. This will soften the skin and is less likely to tear, which can cause you pain. If skin is already torn, cover it with a bandage, however small. Our hands come in constant contact with bacteria, the bandage will protect it from irritation and infection. 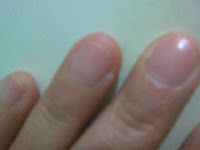 this is nice... i sometimes have this..
Great tips on the hang nail! Normally I just pull them apart. Thanks for the tips. I definitely pull at them, and then it gets inflammed and hurts even worse than before. You'd think I'd learn right? Wrong. It may not be the popular vote, but I usually get some good tweezers and pick them out then flush with peroxide and coat with Neosporin before bed. Now this I will try. I have an awful time with my cuticles and my nails. Very nice tips. Thanks for sharing them. I guess everyone experience this hang nail from time to time, right?